Bob Lutz rides again. And again. Everyone's favorite former auto executive has saddled up with a new electric scooter company, investing a sizeable chunk of change into Current Motor and taking a spot on the company's advisory council. As of right now, the scooter maker offers a total of three different two-wheeled rides with varying top speeds. The base model, the Economy C124E, carries an MSRP of $6,499, maxes out at 55 mph with a range of around 30 miles, and supposedly charges in just four hours from a standard 110-watt home outlet. The lineup tops out with the Deluxe 130 which goes for a shave under $8,000, though its top speed of 65 mph and range of 50 miles makes it a slightly more appealing option. Lutz says his work with Current Motors makes perfect sense given his dedication to bringing an EV to market throughout his career. He's already championing a pilot program that will offer buyers $2,000 off the sticker price if they commit to providing feedback about their machines via Twitter and Facebook. Hit the jump for the full press blast. 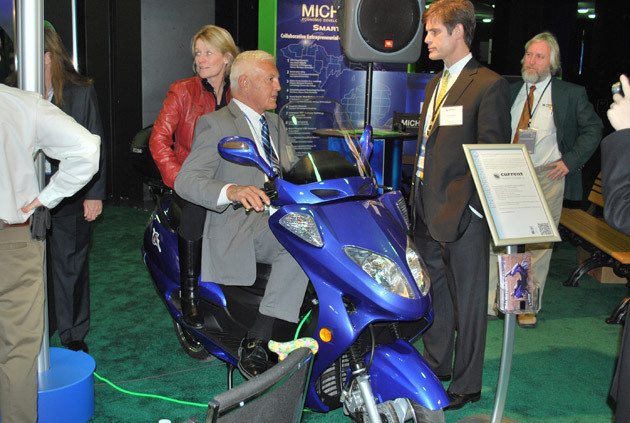 Bob Lutz joins electric scooter maker Current Motor originally appeared on Autoblog on Wed, 19 Jan 2011 08:00:00 EST. Please see our terms for use of feeds.